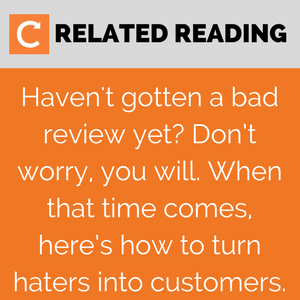 You can spot (and purchase) helpful new products...before your competitors do. You’ll get a free education from trainings and demonstrations, including game-changing VR and AR demos. You have an opportunity to network with suppliers, fellow business owners and managers, and industry insiders. And perhaps the most compelling reason: We want to meet you there! While of course we love all things digital, there’s nothing like meeting customers and other professionals in the field face to face. 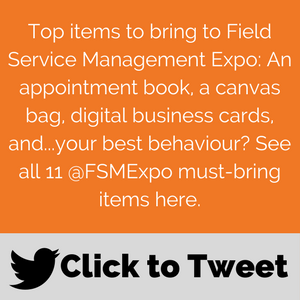 If you do decide to attend Field Service Management Expo (FSME), knowing what to bring is key. Whether it’s your first trade show or you’re an experienced trade show pro, taking the right supplies (and attitude) makes all the difference between a profitable experience—and an exhausting, time-wasting, and money-draining one. These are our top picks for what you need to take with you to get the most out of Field Service Management Expo—or any other trade show. Knowing what your main goals are will keep you from being seduced by booths, products, and presentations that aren’t a priority for you. Your trade show time is limited, so choose wisely! Good shoes. I personally have walked 11 kilometers during a day of trade show attendance, and this Gizmodo writer backs up my experience. A comfortable pair of walking shoes is crucial. A canvas bag. You’re sure to receive loads of literature and swag; while some exhibitors give away branded totes, it’s best to bring one just in case. Business cards. Don’t have any, or prefer to go digital? Immediately connect with the people you meet on LinkedIn. Another option is one of these digital business card apps. A notebook or digital device. This is for jotting notes (or creating recordings) at the educational and inspirational presentations trade shows are known for. A charger. Don’t let your phone or tablet run out of juice when you’re in the middle of adding a contact or live-Tweeting a presentation for your employees! If you’re worried about finding an open electrical outlet, try a portable charging pack like one of these. A snack. Your stomach is rumbling but the nearest snack venue is halfway across the exhibit hall...and you don’t have enough time before your next appointment for the long trek. Pack a granola bar or trail mix to tide you over in times like these. These items won’t take up too much space in your bag, purse, or pockets, and they’ll make your trade show experience a lot more comfortable (and productive). To make sure the exhibitors you want to talk to most have time for you, schedule appointments with them ahead of time. Plan your days to make sure you get to talk to the suppliers you’re most interested in and attend the most relevant presentations. FSME offers a free Meetings Service that lets you easily schedule appointments with the manufacturers and distributors you want to talk to; you can meet them at their booths, or use one of the private meeting areas or lounges. 4. A list of questions. You’ve now got an appointment book full of meetings. Instead of going in cold and hoping to get the information you need, look over the suppliers’ websites and trade show listings, and write up a list of questions that will help you decide whether the products are right for your field service business. Trade shows are known for featuring presentations and trainings packed with valuable information. For example, FSME offers short sessions led by industry pros on hot topics, plus inspirational speakers like leadership expert Nicky Moffat. 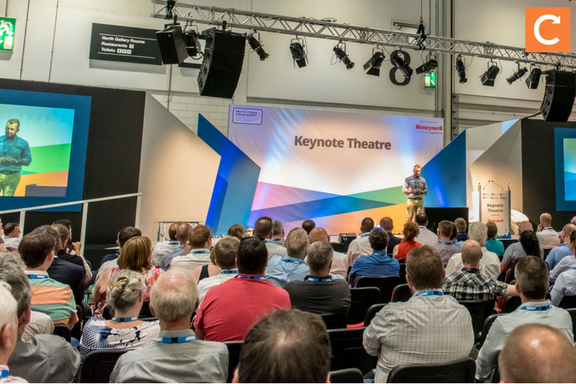 Presentations like these can be as invaluable to your business as the tools and software you purchase on the exhibitor floor. Be sure to make time for them, and take notes to share with your employees back at the office. 6. One (or more) of your employees. Being a field service company at a field service trade show is like being a 4-year-old at Disneyland. Shiny new tools and hot new software everywhere you look! As tempting as it is to sign on for every offer you see, resist saying ‘yes’ to the first supplier you meet. The products and services you’ll find at FIeld Service Management Expo can be business-changing, life-changing—and sometimes expensive. Be sure to ask questions, look at reviews, compare the product with others at the show, and do your research before deciding. Remember the ‘4-year-old at Disneyland thing? Racking up purchases in the excitement of the moment will cause you to blow right through your budget. Keep track of your spending on your phone or tablet to make sure you stay on track. Try a free app like Expensify, which is made for people on the go. While you should go to the show with a plan, be sure to leave enough time in your schedule to visit exhibitors you hadn’t considered who catch your eye—and keep an open mind to technologies and concepts you may not have heard of before. The perfect product or partner for your business may be in the very next booth! While trade shows can have a buddy-buddy feel and are a great place for networking, in the end they’re about business. Here are a few DON’Ts that will ensure you make the best impression while making the show productive for yourself, other attendees, and exhibitors. Don’t overstay your welcome in a booth. Other attendees want a chance to ask questions and view demos too! Don’t spend a lot of time chatting with suppliers you’re sure you’re not interested in. Remember—just as you’re at a trade show to benefit your business, so are the exhibitors. Don’t be offended if booth staff can’t answer overly technical questions about their product. Broad, open-ended questions like ‘What do you have coming out in the future?’ will net you more valuable information anyway. Don’t disappear. You can make some of the best connections after the trade show is over for the day. Just so we don’t leave you feeling bad, we’ll end with a fun item you’ll need to bring to the show. As we mentioned, the show doesn’t end when the convention center closes for the day. Often, exhibitors and attendees head out together to talk over dinner or drinks, and some exhibitors even host parties. Be sure to stay rested, and even bring a change of shoes, so you’ll have the energy to keep the show going after hours. We’d love to meet you at Field Service Management Expo 2018. We’ll be at booth P1100. Stop by and say hello, or use the Meetings Service to schedule an appointment with us and learn about how Commusoft can help you streamline your business. Register for Field Service Management Expo 2018 now.